Why give? At the Girl Scouts, we work to empower future female leaders to not only be women of courage, confidence and character, but we charge them to make a difference in the world. From grades K-12, our Girl Scouts are encouraged to go out in their communities and give their time to improving society. Sometimes that means performing a service other times it might mean running a collection. What we empower the girls to do, is to do something that makes a lasting difference. 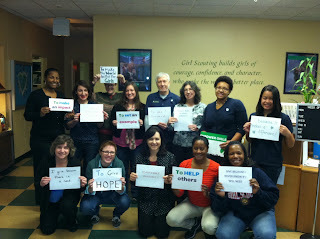 We don’t only ask this of our girls, but staff, board members, volunteers, parents, alumnae and supporters are included. We ask them to give their time to building tomorrow’s leaders, to donate funds to help run amazing programs in areas like STEM, Health Living and Leadership and to give their voices to help create change in making the world a better place for girls. On December 3, GSCSNJ will support #GivingTuesday, a day to give among the hustle and bustle of the holiday season. It’s a day to remember the importance for giving, when you might be busy making lists, taking trips to the mall and getting ready for the end of the year. Whatever your motivation to give, join us in the celebration. Our staff is ready, with our #UNselfie group photos, listing reasons why we like to give. Below are a few reasons we give, what’s yours? Because someone gave to me. To make a lasting difference. Because I have the privilege to give back. To share joy with others. To make someone’s day a little brighter. Because money can buy happiness when it is given to those in need. Want to give to GSCSNJ? Visit www.gscsnj.org/donate!